Around this time each year my family decides that they have had enough eggnog. After all, I did start buying it around Thanksgiving time with a steady purchase of 1/2 a gallon every week. I usually don't figure this out until I find myself pouring it down the drain because we have surpassed the expiration date and I need to make room in the refrigerator. This year I decided to do things differently. I rounded up some ideas of how I could use the left over eggnog that I knew I would find it on the top shelf hiding behind the orange juice and milk. My thoughts went from fudge, to bread pudding, then to an eggnog applesauce cake or, the best one, eggnog ice cream. These recipes would pretty much cover any amount that I would find nestled in the very back shelf. The ice cream is going to require a lot of eggnog, I can only hope I find a full half gallon. Last night I could not sleep. I call it Holiday/Christmas/Company anxiety. My parents are coming into town on Saturday and any company causes me to "wig out" a bit. The older I get the worse it becomes. When my guests arrive on my doorstep, the anxiety melts away. 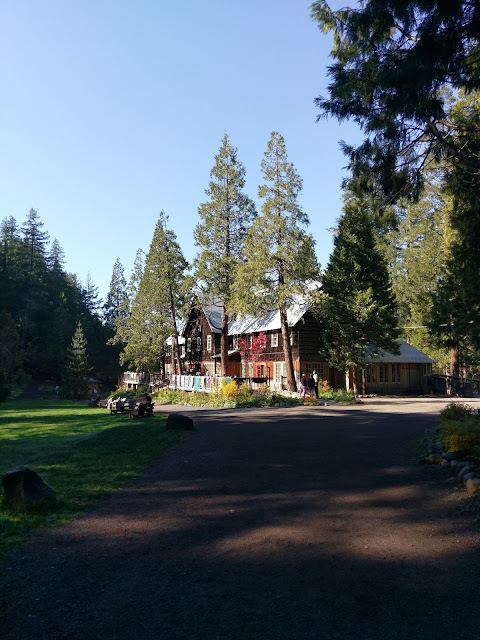 It is the anticipation of people coming to stay in my home that riles me up. "What if I forget to clean something"? Like the microwave, which I have done before. "What if I make something they don't like?" Again, it has happened. "What if the activities I have planned don't work out?" This usually doesn't happen, but it could. "What if I decide to run away and come home when it is all over?" This is one question I ask myself a lot but I have actually never done because, like I mentioned above, I always have a great time and things go according to plan. I believe I am my own worst enemy and I am sure it stems from my childhood and the need to please everyone, be the peace maker and strive for perfection. So what does this have to do with bread pudding, early mornings and eggnog? The anxiety was my reason for not sleeping, which caused me to clean out the fridge, which then led me to find the eggnog hiding behind the beef broth, that triggered my crazy 4am brain to make bread pudding. Remember that was on my list of things I could make. I am going to assume that if you are like me, have Celiac or are gluten intolerant , then bread pudding is something that you do not make often (or, if you are like me, never). I don't usually make it because my family says they don't like it and I have never found the right type of gluten free bread to hold the egg/milk mixture (again, that was the case, until today). A while back I was contacted by Udi's to try some of their products. If you remember I was a bit busy being pregnant and trying to stay afloat with the pregnancy. I turned down a lot of opportunities because I just could not handle one more thing. After Finnley was born, I reached out to all of the companies that I wanted to work with. Udi's made the cut. They graciously sent me a box of goodies to sample and try. My family was equally excited at the sight of a box of food being delivered to our doorstep. I just want to say thank you to Udi's for asking me to create a recipe using their products. The one thing I find necessary when eating bread pudding is a sauce. My daughter has been asking for butterscotch everything this year and so it sounded like the perfect addition to this Easy Eggnog Bread Pudding. I am going to be the first to say, that it was excellent and I will be making it again. Bread pudding has a tendency to get a little crispy or dry on top with the middle being warm and soggy. 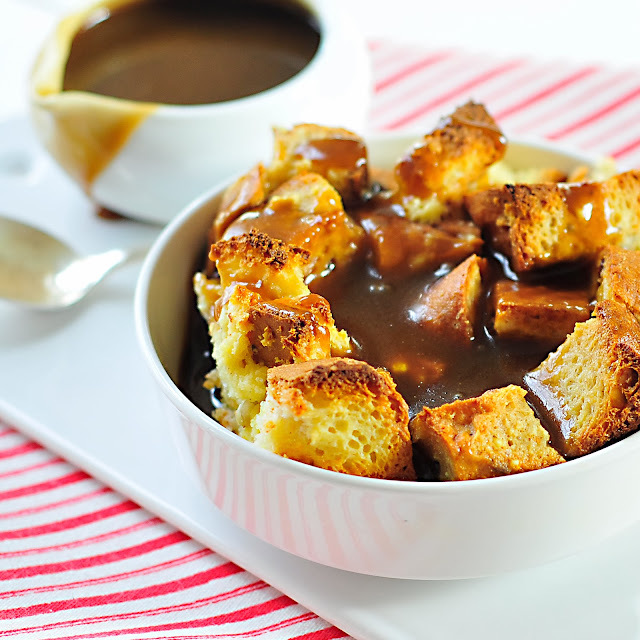 Serving the bread pudding with a sauce will make the top layer soften a bit and add even more gooey-ness to the dish. Two things I would recommend. The first is to buy the best eggnog you can find and afford. The second, don't try to change the bread combination. You really need the gluten free bagel's texture to hold it all together. My final comment is that this bread pudding does not have any added sugar. I am trying to be mindful of the amount of sugar my family consumes. If I can go without it, I do. 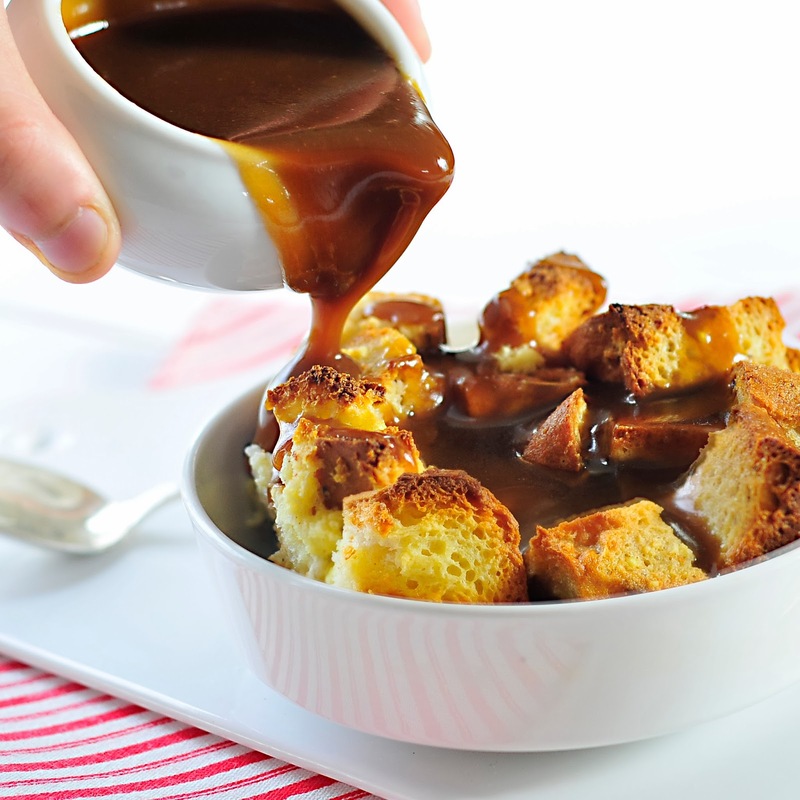 With that being said, this recipe is in no way a low sugar bread pudding because the eggnog has a lot and if you use the butterscotch sauce, well...it is super sweet. I strongly recommend making the butterscotch sauce. Let me know what you think. I do love hearing from readers. Enjoy! 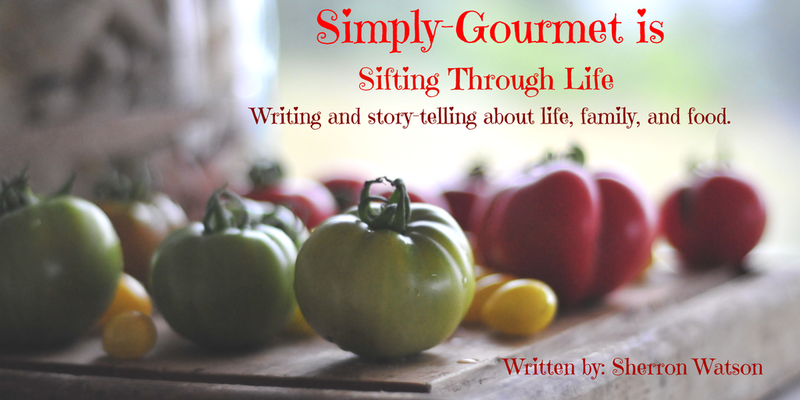 *Disclosure: The opinions expressed in the above written content are those of the writer, Sherron Watson. She has not been paid to write a review or create a recipe. Sherron was given a box of products and asked to participate in a recipe round-up which will appear on Udi's pinterest board. 1. Combine the bread, eggnog, milk and eggs. Using a spatula, mix well. The bread will need to be stirred a few times to ensure that each piece is coated with the wet ingredients. 2. 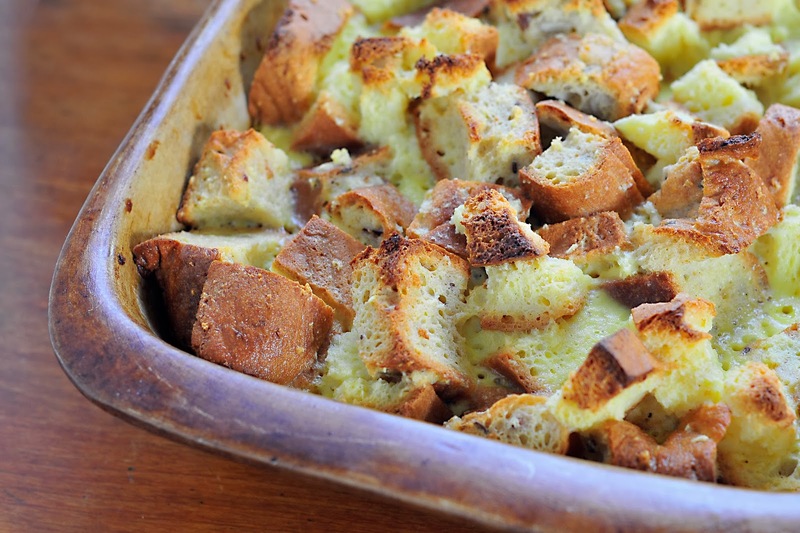 Place bread mixture into a well buttered baking dish. I use a dish that is an odd size, 8X11 rectangular dish. My mixture ends up being about 2 inches thick. I would not go any shallower than this. 3. Cover with foil and refrigerate overnight. I would recommend a minimum of 4 hours if you decide to do this on the same day. 4. Preheat oven to 350 degrees. Remove bread pudding from refrigerator. Pull back the foil and give it a good stir to re-coat the top layer. Cover again. 5. 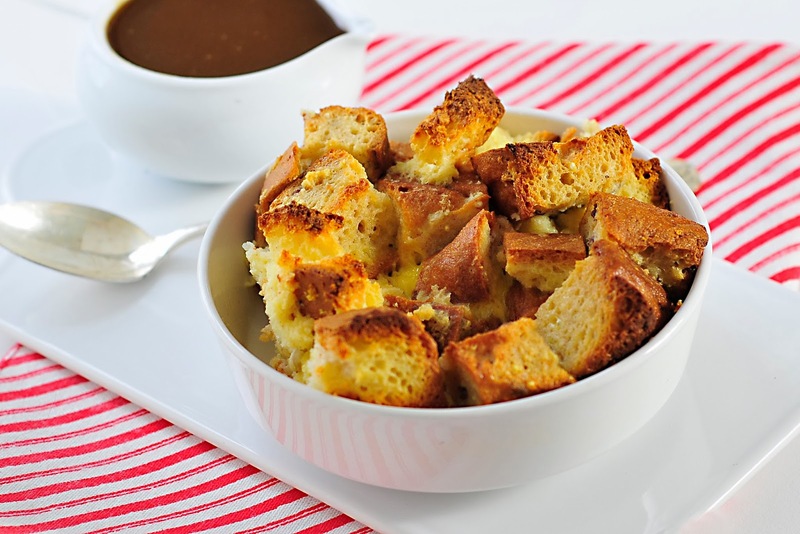 Bake eggnog bread pudding for 30 minutes. Remove foil and continue baking for 15-20 more minutes. You want the tips of the bread cubes to be a golden brown and the egg mixture to be firm. 6. 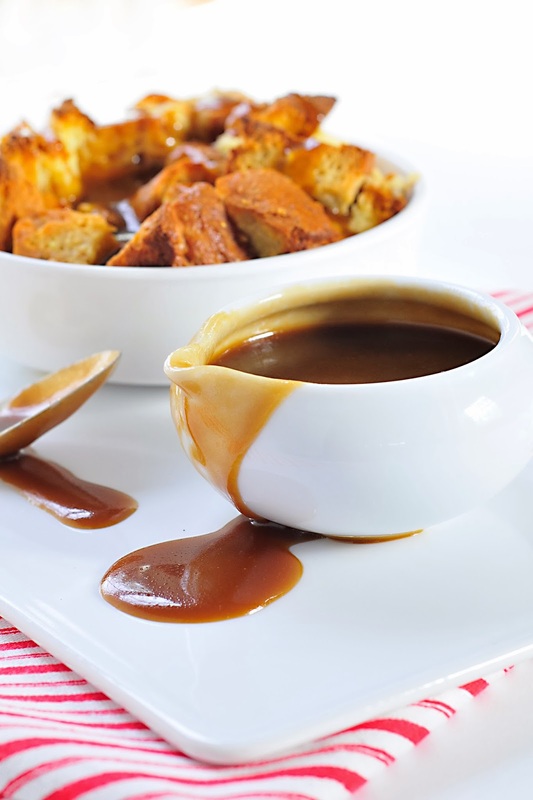 The last 15 minutes make the butterscotch sauce (recipe below). 7. Remove from oven, cool for a few minutes and serve with sauce. 8. Refrigerate all left overs and reheat in the microwave. 1. In a small saucepan, combine all of the above sauce ingredients. 2. Set your heat to medium and bring to a boil (5 minutes or so), stirring every once in a while. 3. Once the sauce boils, turn heat down to a medium low and simmer to thicken the sauce. Continue cooking for 5 minutes. Stirring occasionally. Sauce will start to darken when it is close to finishing. 4. Remove from heat and serve warm. Sauce will thicken more the longer it sits. Just made this for New Years breakfast and it was delicious! The butterscotch sauce is amazing...may need to try it on ice cream as well! Thanks so much!! Thank you Sharon. I agree, a big bowl of ice cream would go quite well with the sauce. Happy New Year.